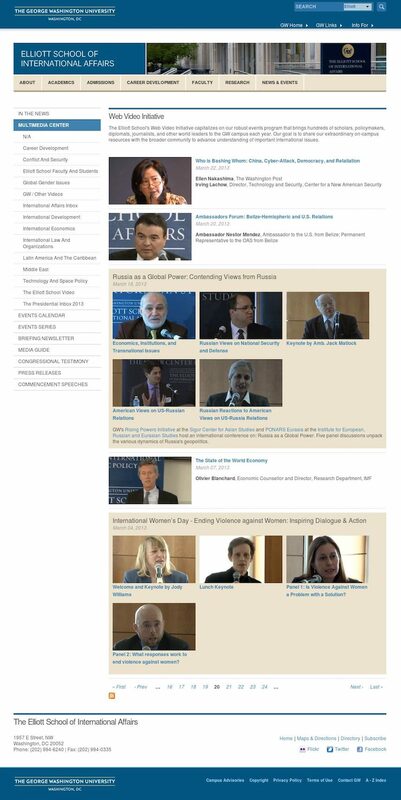 GW utilizes Drupal as its core content management system within the university. As such, Daymuse works with the university to provide implementation, expertise, and support on a variety of Drupal-based projects. 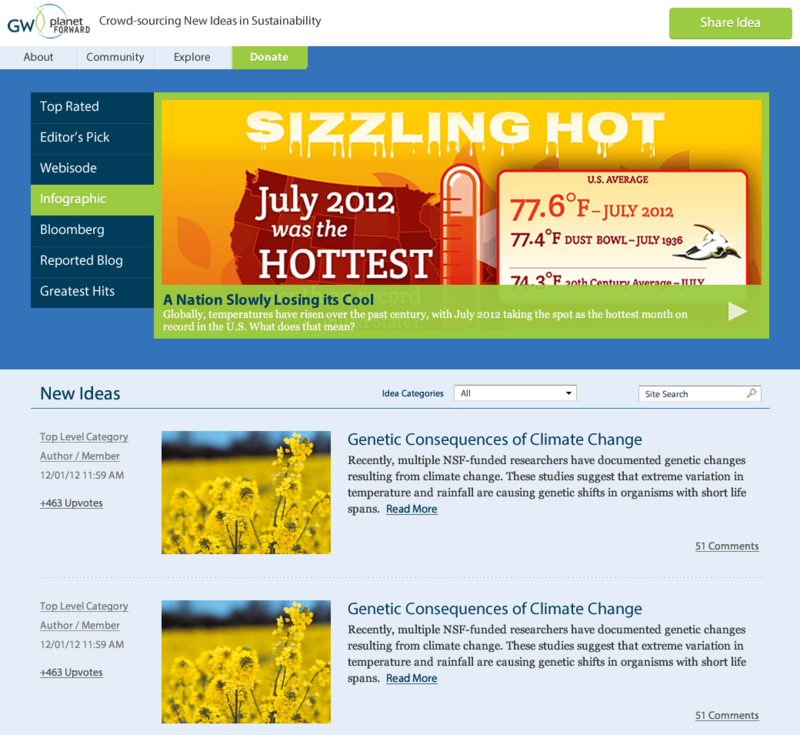 The university also utilizes tools like MediaWiki and Wordpress along with Daymuse's related services. The George Washington University is a private, coeducational comprehensive university located in Washington, D.C. in the United States. The university was chartered by an Act of Congress on February 9, 1821, as The Columbian College in the District of Columbia. Daymuse Studios has worked with GWU since 2009. You'll find a list of projects below which our partnership with the university has produced over the years. 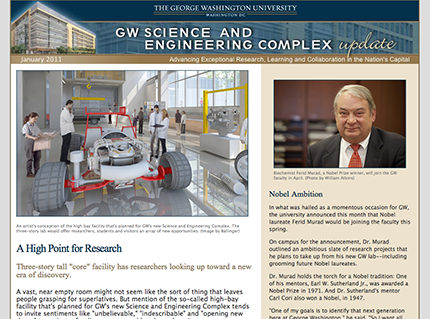 "Make it compatible with nearly 30 e-mail clients"
The George Washington University Science & Engineering Complex is a new multi-hundred-million dollar complex being constructed in DC on GWU’s campus. The upcoming programs, construction, and ideas needed to be communicated to the the greater University population and neighbors. They needed an e-mail template that would be on brand and flexible. The e-mail template needed to be compatible with nearly 30 different e-mail clients, it’s always surprising to people that e-mail template cross-compatability can be more difficult than browser cross-compatability! 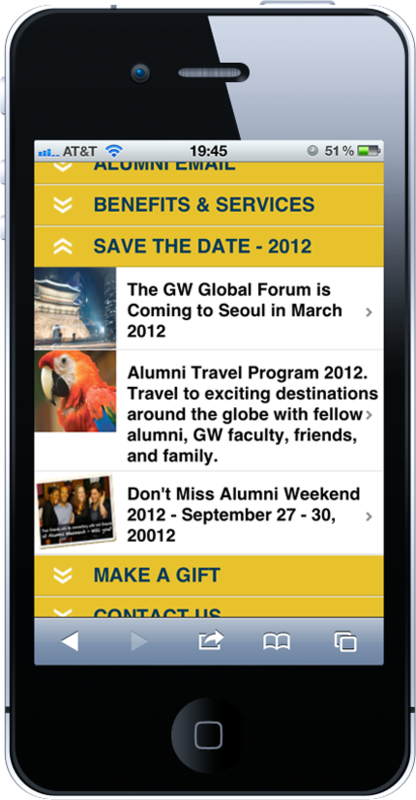 "We maintain our site via Dreamweaver Templates and want a cross-compatible Mobile Site"
Alumni & Development, part of The George Washington University, was seeking a mobile version of their website. They needed a top-to-bottom approach for design and wanted full compatibility with the major smartphones on the market. 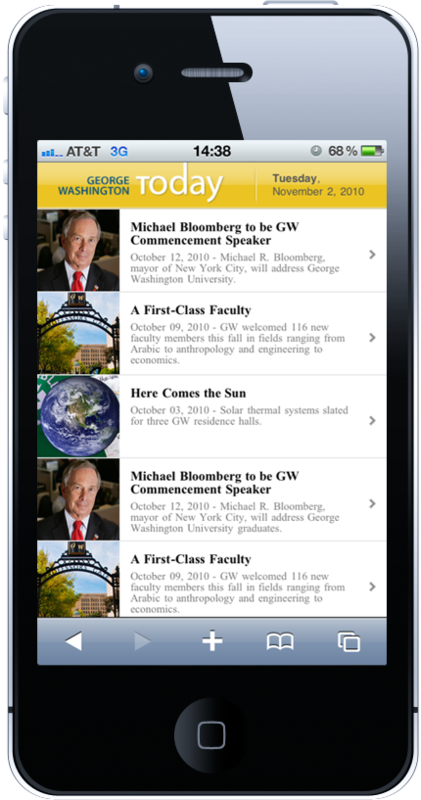 "This should work as both a Mobile Site and possible E-mail Template -- and it should work on major Smartphones"
GW Today, The George Washington University’s premiere news source, was seeking a mobile version of their website. They needed a top-to-bottom approach for design and wanted full compatibility with the major smartphones on the market. 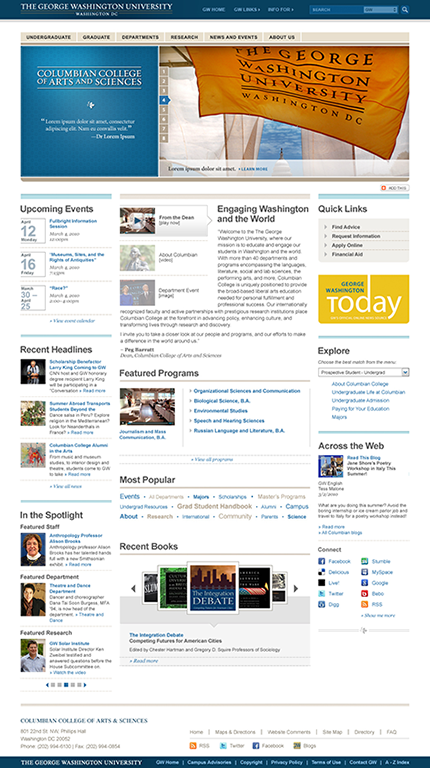 "We're building a Design System for over 700,000 pages and dozens of organizations"
The George Washington University, in Washington DC, has been working to centralize their branding and design approach for the past few years. The Universal Web Presence is a multi-million dollar initiative to do just that. The project focuses on the eventual goal of unifying the design of the University’s some 700,000 web pages and dozens of Colleges, Divisions, and Departments. 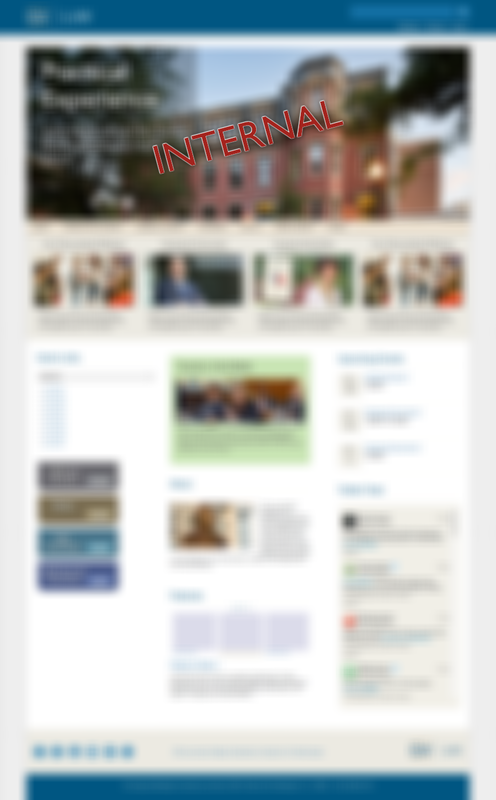 "There's several Schools & Colleges representing different Business Units and dozens of Internal Organizations...And we need a Design System"
While GWU was undergoing a thorough change to their web presence via the Universal Web Presence initiative, the University was also undergoing a design review of their individual schools and branding. This yielded many new design ideas, some of which have been implemented and some of which remain (and probably always will be) as concepts. I’ve been involved with providing technical expertise for the Visual Design and Information Architecture teams as well as front-end prototyping.